Mayor Crombie with Mayor’s Youth Speaker Series guest speaker Professor Patrick Gunning. Mississauga – A strong network and connection to mentors can open doors for young people as they transition into the workforce. 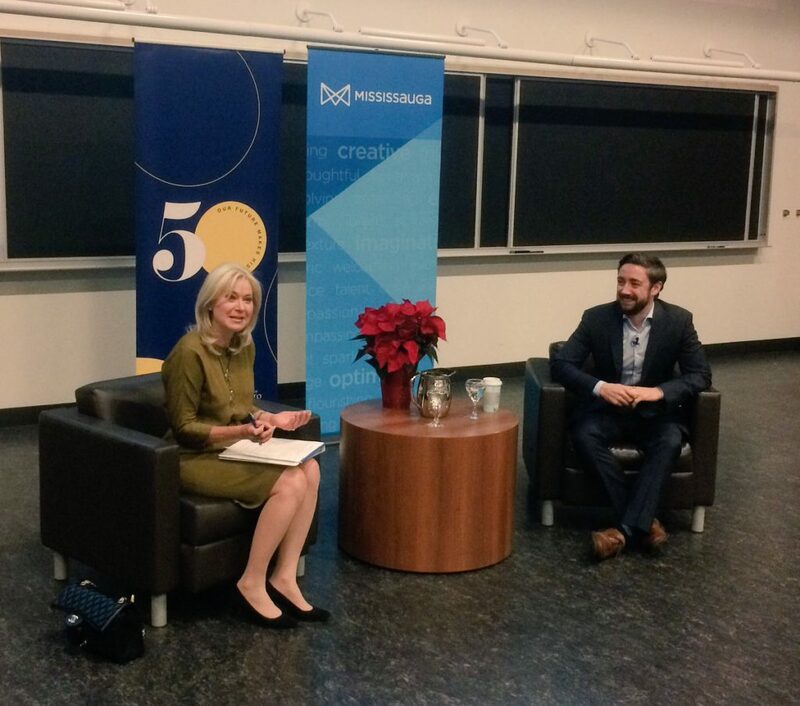 The Mayor’s Youth Speaker Series is part of the agenda to help youth reach higher, Mayor Crombie said yesterday evening during the Mayor’s Youth Speaker Series which took place at the University of Toronto Mississauga. Over 200 youth were in attendance to hear from guest speaker Professor Patrick Gunning, Canada Research Chair in Medicinal Chemistry Professor at the Department of Chemical and Physical Sciences at the University of Toronto Mississauga. “We launched the Mayor’s Youth Speaker Series last year to be an ongoing series of keynote discussions with prominent Canadians from different sectors, aimed at inspiring youth, and providing them with guidance as they prepare to enter the workforce.” said Mayor Crombie. “As an accomplished researcher and professor, Dr. Patrick Gunning is in a unique position to provide insight to both his own success and guidance to young people who are just embarking on their professional journey,” added Mayor Crombie. Many youth face multiple barriers including slow-job growth economies, low-quality jobs, skills mismatch and social discrimination, among others. “We must do everything we can to support local youth to pursue their passions, find employment opportunities and achieve their career aspirations”, Mayor Crombie said. Mayor Crombie also hosted the second annual Mayor’s Youth Employment Expo this past Sunday. The expo featured over 70 exhibitors and workshops designed to help youth build and develop networking, resume-writing and interview preparation skills. LinkedIn, Magnet and the Centre for Education and Training led these workshops before youth met with employers. The Mayor’s Youth Speaker Series and the Mayor’s Youth Employment Expo are part of a larger agenda to tackle challenges surrounding youth unemployment. Tonight’s Speaker Series event with Professor Gunning was broadcast over Facebook Live and can be watched by visiting www.facebook.com/bonniecrombie. Professor Patrick Gunning is the second guest speaker in the series. The inaugural speaker series event featured guest speaker Amanda Lang, award-winning journalist of Bloomberg News. Click here to watch it. This entry was posted in Carousel News, Mayor’s Youth Jobs Initiative, News. Bookmark the permalink.